We all know how great Brooklyn is on his skateboard and he's often posting pictures and videos of his crazy boarding antics. Well, his latest video shows him skateboarding down a staircase and jumping over his dad, David Beckham, who can be seen cupping his Golden Balls. Good work Brooklyn Beckham, and well done David for being so brave. It could all have gone horribly wrong, and I'm so glad that it didn't. Father David Beckham has released a video of a lovely family moment on his Instagram account, where Brooklyn is tossing a pancake on actual Pancake Day. It all goes a little bit pear-shaped when the boy wonder decides to show off and quickly spin around during the toss. The pancake doesn't quite end up on the floor though, but it was certainly close! 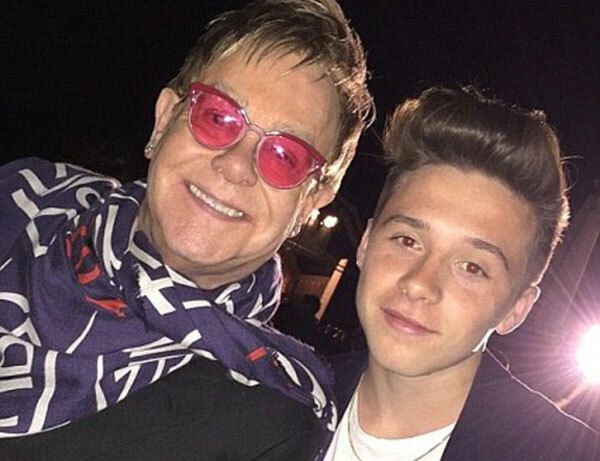 Godfather to Brooklyn Beckham, Sir Elton John has publicly spoken out about Burberry's recent decision to use Brooks as a photographer for one of their photo shoots.